The image of the United States remains overwhelmingly negative in Pakistan, and few Pakistanis express confidence in U.S. President Barack Obama to do the right thing in world affairs. 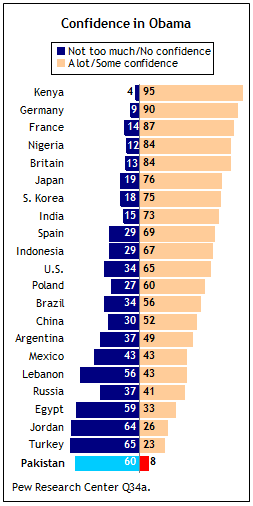 America’s favorability in Pakistan is lower than in 18 of 21 countries other than the U.S. included in the 2010 Pew Global Attitudes survey and matches the dismal ratings the U.S. receives in Turkey and Egypt. About six-in-ten Pakistanis consider the U.S. an enemy of their country and express concern that the U.S. could become a military threat to Pakistan. Most also oppose U.S.-led efforts to fight terrorism and say U.S. and NATO troops should leave Afghanistan as soon as possible. When it comes to U.S. policy toward India and Pakistan, nearly half of Pakistanis say the U.S. favors their archrivals, while just 13% say the U.S. is fair and 6% say it favors Pakistan. Opinions about U.S.-Pakistani relations are mixed, with about as many saying they have improved in recent years as saying they have not improved. Still, a solid majority of Pakistanis believe it is important for relations between the U.S. and their country to improve. Assessments of how much financial aid the U.S. gives to Pakistan are also mixed; 23% of Pakistanis say the U.S. gives their country a lot of money, 22% say it gives a little, and 26% say the U.S. gives Pakistan hardly any aid (10%) or none at all (16%). Of those who say their country receives at least some assistance from the U.S., about an equal number say U.S. aid is mostly for military purposes as say it is mostly for economic development or for both equally. Obama receives lower ratings in Pakistan than in any other nation polled in 2010. Fewer than one-in-ten Pakistanis have confidence in the U.S. president to do the right thing regarding world affairs. 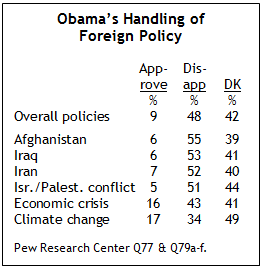 Overall evaluations of Obama’s international policies are also negative, and majorities disapprove of the way he is handling the war zones of Iraq and Afghanistan as well as two important issues in the Middle East – Iran and the conflict between Israelis and Palestinians. Fewer than one-in-five Pakistanis (17%) have a favorable opinion of the U.S., a rating virtually unchanged from recent years. America’s favorable ratings are somewhat higher in Sindh than in other provinces; 27% in Sindh have a positive view of the U.S., compared with 15% in Khyber Pakhtunkhwa and 13% in Punjab. The American people also receive low ratings in Pakistan. About six-in-ten (61%) have a negative view of Americans, while just 18% express a positive opinion. Of the 21 publics surveyed outside of the U.S. in 2010, only Turks give Americans more negative ratings than Pakistanis; 72% in Turkey have an unfavorable view and 16% have a favorable view of Americans. America’s image challenge in Pakistan stems, in part, from negative attitudes toward key elements of American foreign policy. For example, nearly two-thirds (65%) of Pakistanis think U.S. and NATO troops should be removed from Afghanistan as soon as possible and 56% oppose U.S.-led efforts to fight terrorism. Majorities also say the U.S. does not consider the interests of countries like Pakistan (56%) and express concern that the U.S. could become a military threat to their country (65%). Despite giving America consistently low ratings, Pakistanis offer more positive assessments of their country’s relations with the U.S. than they did a year ago. About as many now say U.S.-Pakistan relations have improved in recent years (36%) as say they have not improved (39%); a quarter do not have an opinion. 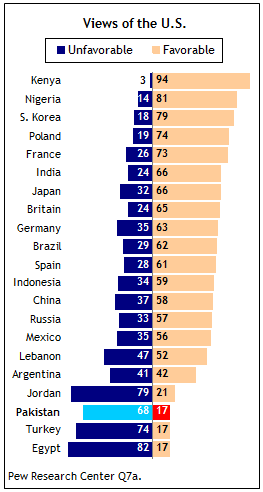 In 2009, far fewer said relations between their country and the U.S. had recently improved (27%) than said they had not (43%). In contrast, Indians are now less likely than they were a year ago to say that relations between the U.S. and Pakistan have improved recently. 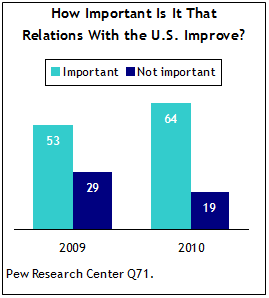 Four-in-ten in that country say U.S.-Pakistani relations have gotten better and slightly more (44%) say they have not. In 2009, nearly half of Indians (48%) believed relations between the U.S. and Pakistan had improved, while 38% said they had not. While Pakistanis offer mixed views about whether relations between their country and the U.S. have improved in recent years, a clear majority wants relations to improve. More than six-in-ten (64%) say that improving relations with the U.S. is important, up from 53% who expressed this opinion a year ago. Those in Sindh and Punjab are especially likely to say that improving relations with the U.S. is important (71% and 66%, respectively), but a majority in Khyber Pakhtunkhwa (55%) also shares that view. Nearly half of Pakistanis (47%) say U.S. policies toward India and Pakistan tend to favor India, down from 54% who said the same in 2009. Just 6% say American policies favor Pakistan, while 13% say the U.S. is fair and about a third (34%) do not offer an opinion. For their part, nearly four-in-ten Indians (38%) believe U.S. policy in South Asia favors their country and a third say the U.S. is fair. Few Indians (14%) say the U.S. favors Pakistan. Those who live in Punjab are far more likely than those in other regions to consider the U.S. an enemy of Pakistan; about seven-in-ten (69%) in that province express this opinion, compared with 52% in Khyber Pakhtunkhwa and 40% in Sindh. The view that the U.S. is an enemy of Pakistan is also much more prevalent among Pakistanis who are affiliated with the Pakistan Muslim League-Nawaz (PML-N) than among those in the Pakistan Peoples Party (PPP). About seven-in-ten (72%) in the PML-N, Pakistan’s opposition party, consider the U.S. an enemy; just 9% say it is a partner and 12% say it is neither. 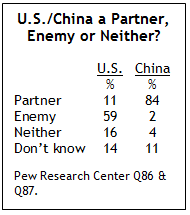 Fewer than half (46%) in the PPP see the U.S. as an enemy, while 15% consider it a partner and 21% say it is neither. When asked how much financial aid the U.S. gives to their country, 23% of Pakistanis say it gives a lot, 22% say it gives a little, and 10% say the U.S. gives Pakistan hardly any financial assistance. Another 16% of Pakistanis say the U.S. does not give their country any aid, and nearly three-in-ten (29%) say they do not know how much financial assistance their country receives from the American government. Awareness of U.S. aid to Pakistan is more widespread in Sindh than in other provinces. More than six-in-ten in Sindh say the U.S. gives their country at least some aid, including 28% who say the U.S. gives a lot, 23% who say it gives a little, and 11% who say American aid is minimal. By comparison, 56% in Punjab and 48% in Khyber Pakhtunkhwa say Pakistan receives financial assistance from the U.S. Among Pakistanis who say the U.S. gives Pakistan at least some aid, the same number believes American financial assistance is increasing as believe it is decreasing (33% each); about one-in-five (18%) say U.S. aid to Pakistan is staying the same. Those who say Pakistan receives financial assistance from the U.S. also offer mixed opinions about how U.S. aid is allocated. 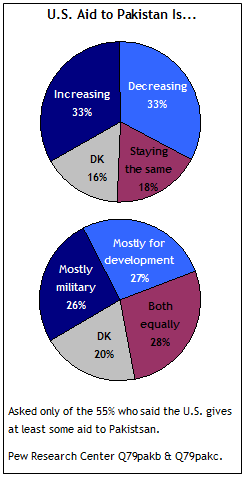 About a quarter (26%) say American aid to their country is mostly military, and about the same number say it is mostly to help Pakistan develop economically (27%) or both equally (28%). Barack Obama receives overwhelmingly low marks in Pakistan. Just 8% express at least some confidence in the American president to do the right thing regarding world affairs, lower than in any of the other 21 countries surveyed in 2010. Six-in-ten Pakistanis say they have little or no confidence in Obama, and about a third (32%) do not offer an opinion. Moreover, only 13% believe Obama has a better understanding of Pakistan than most Western leaders; more than three times as many (42%) say he does not, and 45% do not know. In 2009, about one-in-eight (13%) Pakistanis said they had confidence in Obama when it came to international affairs, while about half (51%) said they did not have confidence in him; 36% did not offer an opinion. About one-in-five (18%) said Obama had a better understanding of Pakistan than most Western leaders a year ago. Pakistan is the only predominantly Muslim country surveyed where more express confidence in Osama bin Laden than in the American president. About one-in-five (18%) Pakistanis have at least some confidence in the al Qaeda leader to do the right thing in world affairs, while 45% lack confidence in him. Evaluations of Obama’s foreign policies and assessments of his handling of specific issues are, on balance, negative, but many Pakistanis, particularly women and the less educated, do not offer an opinion on these matters. Overall, 48% disapprove of Obama’s policies, while only 9% approve and 42% say they do not know. Majorities of Pakistanis disapprove of the way the American president is handling Afghanistan (55%), Iraq (53%), Iran (52%), and the Israeli-Palestinian conflict (51%). The percentages of Pakistanis who approve of Obama’s handling of each of these issues are all in the single digits, while about four-in-ten do not offer assessments. Pakistani views about Obama’s handling of the global economic crisis and global climate change are somewhat less negative than opinions about his handling of the two war zones and the Middle East. Still, only about one-in-six approve of the way the American president is dealing with these two issues (16% and 17%, respectively), and many do not offer an opinion.